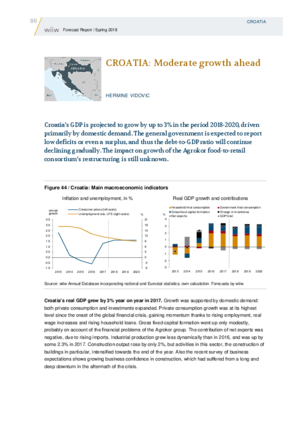 Croatia’s GDP is projected to grow by up to 3% in the period 2018-2020, driven primarily by domestic demand. The general government is expected to report low deficits or even a surplus, and thus the debt-to-GDP ratio will continue declining gradually. The impact on growth of the Agrokor food-to-retail consortium’s restructuring is still unknown.